I know it. I know you always listen to rap, and you’re like, damn, “How has rap changed over the past 4 decades since its inception in the early 70s?” Or you might ask, “Are rappers more complex than they are today, or has the development of rap been relatively straightforward?” Well, I’m here to answer those questions. First check out the data table and charts below on your own. Afterwards, I provide some analysis of mine own. 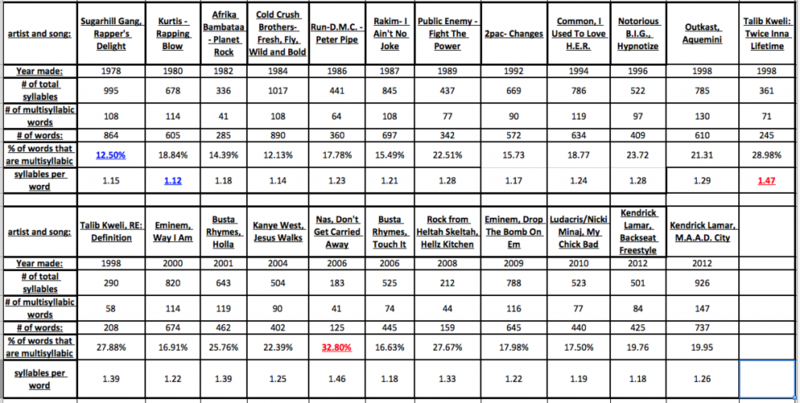 The most popular artists I analyze, if you care to look for them int the chart specifically, are 2pac, Notorious B.I.G., OutKast, Nas, Run-D.M.C., Kendrick Lamar, Eminem, and Kanye West. The data points on the charts are tagged with both the year and the value in an (x, y) form. Afterwards, I’ll talk about what these charts mean a bit. 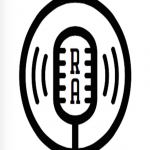 Because I’m a complete weirdo (but also to win a competition to present a lecture at the Region IV Society of Composers, Inc. conference in KY that you can watch the end of here,), over the course of about 5 months I transcribed and analyzed 23 different rap songs. They are evenly spread over the past 34 between 1978 and 2012 years, coming about once every 1.5 years. I chose 1978 because that’s the year of rap’s first mainstream hit, The Sugarhill Gang’s “Rapper’s Delight,” which comprises the first song in this series. The final songs are 2 from Kendrick Lamar, “Backseat Freestyle” and “m.A.A.d city,” from his 2012 album good kid, m.A.A.d city. With those starting and ending points, these 23 songs cover the 34 years between 1978 and 2012 pretty evenly, with the biggest gap being 3 years at two different periods, while sometimes the gap is as small as a year or a few months in the same year. 1.) Does the song contribute to an accurate representation of hip-hop’s cultural history? 2.) Does the song display lyrical excellence that is observable on the page? 3.) Does the song help contribute to the fuller understanding of an individual artist’s poetic range and development? As they say, “Each lyric included had to meet at least one of [these] standards.” For instance, the song “Rappin’ Blow” by Kurtis Blow, “Fresh, Fly, Wild and Bold” by the Cold Crush Brothers,” Outkast’s “Aquemini,” and many others among my 23 songs are included in that anthology. Among the ones that weren’t, such as Kendrick Lamar’s 2 songs from 2012, I think that if Adam Bradley were to re-make the book today after its original publication in 2010, he would include these songs. 2.) The average length of words in rap verses over the past 36 years in terms of syllables per word. I’ve blued the values of each respective metric that are the lowest in that set in the first table, and redded out the value that is the highest. 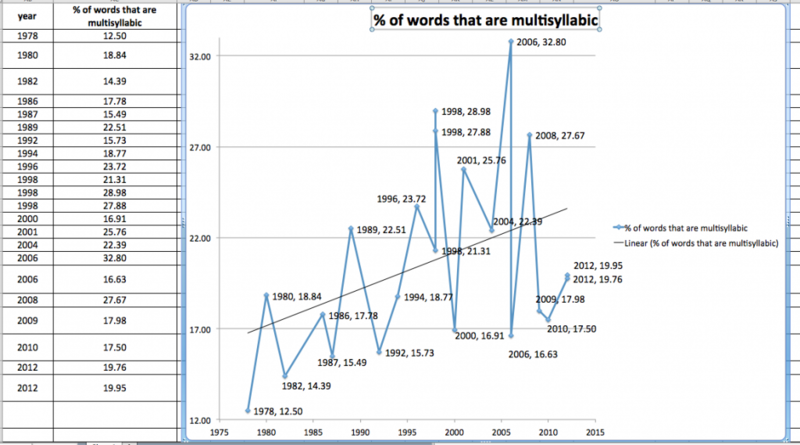 Note that the lowest value of Sugarhill Gang in terms of multisyllabic word percentage and Kurtis Blow in terms of syllables per word occur very early on in rap’s history, while the higher values – such as that for Talib Kweli in 1998 for syllables per word and Nas in 2006 for multisyllabic words – occur much later in rap’s history. The trendline for the multisyllabic word chart is y = .2014x – 381.7. If the last x point is our year 2012, then y = 23.51%, and the first x point at year 1978 means y = 16.66%. 23.51 minus 16.66 equals 6.85%. When 6.85% is divided by the 34 years which this chart covers, you get that the percentage of words that are multisyllabic in rap has increased by .2 % every year since 1978. The same can be done for the trendline for the syllables per word chart, which has a trendline of y = .0034x – 5.4461. So when x equals 2012, y equals 1.39, and when x equals 1978, then y equals 1.28. 1.39 minus 1.28 = 0.11, and .11 divided by the 34 years of this chart means that the syllables per word in rap has increased by a small .0032 syllables per year. Now for some qualitative analysis. I’m always hesitant to enter into the question of whether we can say a certain characteristic of a certain artwork makes that piece of art “good” or “better,” but not because I don’t think we can talk about the answers. I only hesitate because people have a knee jerk reaction to negatively react to such a supposition. But I think I have some good reasons for being able to respond in the affirmative in this instance. So, to be as inflammatory as possible, let me just come out and say it: more complex rap is better. More complex rap is better. This is why complex is better: it introduces more variety into the listener’s ear. The charts above can also be used to explain why the rough list of my top 10 rappers – Black Thought, Jean Grae, Talib Kweli, Nas, Mos Def, Eminem, Pharoah Monch, Notorious B.I.G., 2pac, and a changeable 10th – are all active only from about the early 90s on. Rakim (the 80s) Melle Mel (late 70s to early 80s), Kool G Rap, Big Daddy Kane, and other early pioneers are all noticeably missing from that list. That’s because, to me, their styles (which includes length of their words, among MANY other things) have already been digested and assimilated by today’s rappers. Jean Grae can rap like Big Daddy Kane. Jean Grae can rap like Rakim. But she also added her own Jean Grae-ness to make something new out of something that was old (without any kind of negative connotation.) That’s why all of my work, such as my analysis on 2pac here, or Kanye West and Eminem here, all pay so much attention to the technical aspects of an emcee’s work. It’s what introduces variety into the mix, much more than many other aspects of a rapper’s work can. That’s all I got for now. If any of this statistical analysis is wrong, please let me know. I’m not a statistician, I’m a musician with some math education behind me. Also, if you re-do any of this analysis and our results come out slightly different, remember that I did all of this by hand and mind, with no computer help until I had already compiled the data. If you would like to see the excel info on your own, email me at martinedwardconnor@gmail.com in case you want to screw with it and see what you can come up with. I also have other stats I could put out, such as syllables per rap verse, and what percent of grammatical and musical accents line up and what percentage don’t. Feel free to request these as well. Wow this is awesome. This should be the requisite article for new readers before they dive in to the more specific rapper/song analytics. Great stuff! Thanks Nathan! This is a real fan right here people, take notes. Always up on my newest articles, thanks again! I sometimes pre-send out my articles to see what my smartest and closets fans think, I'll hit you up with an email sometime. I'll take that as a compliment, thanks! Thank you sir! I really appreciate the compliments. You seem a pretty big fan, so if you want the low low hook up with exclusive analysis articles and sneak previews of upcoming articles hit me at mepc36@gmail.com so I get 'em to you…including ones on Myka 9, Aceyalone, as well as suggesting me questions for my interviews (talib/black thought/etc.) Thanks again! You don't provide the raw data, so your findings are invalidated by the lack of transparency.